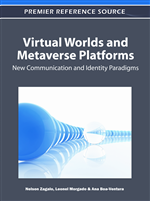 In this chapter we inquire about the role that the narrative acquires in the production of meaning resulting from the contact between players and environment, in the Massive Multiplayer Online Role-playing Game (MMORPG) World of Warcraft1. We posit that through the process of agency, the authorial narrative, structurally positioned at the conceptual core of the virtual world, may contribute to the diversity of variables involved in the creation of a framing (Goffman, 1974) in which the users will engage in interaction among themselves. According to Dramaturgical Sociology, the resulting meaning from an interaction strongly depends on the context in which it is situated; such notion is precisely the reason why, by observing an environment so intensely imbued by symbols from popular culture, European folklore and medieval fantasy, we may also examine how such signs may assist in the creation of behavioral scripts – and how these are played by the players interacting in the virtual world. Despite the usual media framing referring to MMORPGs as mere video games – or, in an oversimplification, games – it is necessary to point out that such terminology does not convey a proper treatment of the complexity caught up in the social and psychological facets of these environments. Such phenomena lacks two distinct characteristics of these virtual worlds: (1) firstly, it summarily ignores the aspects of world that are projected by the environments, with their own rules, acting up both inherently, concerning the rules of the world, or related to the practices of appropriation, evoking the social rules created by the players on their own; (2) secondly, if we take a closer look in the functions such environments are prone to assume, we may approach a ruling that may address virtual worlds not as merely game systems, but will focus on the features concerned with the communication processes or spatial appropriations. Previous research in this field has pointed out several of these practices, ranging from behavioral modifications based on contact with virtual worlds (Yee, 2007) to the possibility of experimenting an environment like World of Warcraft (Blizzard Entertainment, 2004) as an arena for mere flânerie through a digital theme park (Aarseth, 2009). Entertainment forms such as computer games, comic books, theme parks, and television shows have become complexly interwoven, reflecting the interests of multinational conglomerates that have investments in numerous media companies. One media form serially extends its own narrative spaces and spectacles and those of other media as well. Narrative spaces weave and extend into and from one another, so much so that, at times, it is difficult to discuss one form of popular culture without referring to another (Ndalianis, 2005, p. 157). Aarseth (2009) is especially concerned how Ndalianis (2005) deals with theme parks as environments in which we are able to enter the diegesis. The Norwegian scholar establishes a comparison in order to address the spatial practices developed by World of Warcraft (WoW) players. If Ndalianis (2005) is particularly interested in aspects of the Jurassic Park franchise – the movie, the video game and the theme park at Orlando (FL, EUA) – Aarseth (2009) approaches the problem from another angle: he believes the way visitors behave at theme parks is very alike to the way WoW players build up their gameplay practices. According to him (Aarseth, 2009), such comparison is legitimate because WoW players are not able to effectively modify the world under their avatars – and even if they try to do it, by engaging mobs and slaying monsters, these quickly re-spawn, and the locus returns to its initial state. While some MMOGs allow their players to create buildings and govern towns or districts, in Azeroth the player is a ghost-like guest on an uncaring, slick surface, a stranger in a strange land. The nature of the game dynamics can be compared to a theme park ride, the Fordist paradigm of assembly-line mass entertainment as pioneered by Disney: “Move along, please, more enjoyable monsters and sights await around the next corner.” The flying transporter beasts on their fixed trajectories resemble most of all a scenic conveyor belt or a monorail train taking tourists or workers to the next attraction or work site (Aarseth, 2009, p. 114, emphasis added).